The machining world is a conservative one, where change comes slowly. In the screw machine arena change often takes a decade to filter through the industry. Today we are seeing a shift that is catching on in conservation of metal, particularly brass. Hot forges produce near net shapes, which are then machined by multiple station rotary transfer machines. This is a method that has come into vogue for fittings manufacturers. The volumes must be high to justify the initial capital investments, but the paybacks are significant from the reduction in scrap turnings from the traditional way of doing things. With aggressive competition from China, this approach reduces total costs on high volume parts enabling manufacturers to bring the work back to the U.S. Much of the capital equipment comes from Italy, which has pioneered this approach to machining. The American economy continues to bump along, refusing to yield to conventional expectations of its behavior. Recently, the stock market has dropped, giving up all of its gains for the year. The perverse explanation is that the unemployment rate continues to drop, wages are bouncing up a little, and the conventional wisdom says that this will allow the Federal Reserve to raise interest rates a bit after seven years at an extremely low level. The theory is that slightly higher rates will dampen growth. This theory has always perplexed me because it argues that bad is good, and good is bad. High unemployment and low wages are good for growth in the economy? That feels like a flawed idea. The Fed is looking for a little inflation but under 2% per year. The only place I am seeing inflation is in food prices, which seems dictated more by the California drought than accelerated demand. Car sales are solid, home sales are weak for new homes with housing prices very erratic. In some places like Denver prices are shooting up, but over most of the country mortgage lending strictness is keeping demand tepid. The big overhang of school loan debt and slow family formation are also a damper on real estate. One interesting development is the spate of “home flipping” schemes being advertised on the radio. The fact that these charlatans are coming out of the woodwork again means that people think houses are getting hot again. Frankly, I do not think it will be a self fulfilling myth. In the machine tool world, the scuttlebutt I get from auctioneers is that pricing is off 25% from a year ago on mainstream CNC equipment. The builders from Asia and Europe generally deny they are reducing prices, but with yen down 25% in value versus the dollar, it would be easy for Japanese firms to offer discounts to make a deal. The Swiss have a problem with their ever rising currency, but the Germans have a faltering euro to give them cover if they care to discount. Not all auction sales have been weak. The recent Jeyco auction in Toronto done by Hilco, featuring 12 Hydromats and 20 Davenport screw machines had prices surpassing expectations of dealers who attended by 20%. Major League Baseball season is one quarter finished and there are a lot of good stories. Former weaklings Houston, Minnesota and the New York Mets are leading their divisions, and look like legit contenders. Three of the best young players in the game grew up playing against each other as kids in Las Vegas. Kris Bryant of the Cubs, Bryce Harper of the Nationals, and Joey Gallo of Texas could all be superstars together. They played Little League in Vegas at the same time. But the story I like best is that Pat Venditte, the ambidextrous pitcher finally made it to the Majors with Oakland at the old baseball age of 30. I’ve been following Venditte since his days at Creighton University in Omaha, hoping he would make it to the Big Leagues. He’s a slender kid and his pitches are in the mid to high 80s from both sides. They passed a special rule for him, that he must declare a pitching arm when a switch hitter comes to the plate so you don’t have a dance going on at the mound with both pitcher and batter switching sides during an at bat. Venditte has not had an easy journey to the Bigs. The Yankees drafted him in the 20th round in 2008 and he has bounced from team to team in the Minor Leagues until getting his shot a few days ago with the Oakland call up. He has a special six finger mitt which he can wear on either hand which Mizuno made for him after his Dad sent a design and tracing to the Japanese glove maker when Pat was 8 years old. He is still using the original glove. Question: Are things changing at your company? Or is it the same–old same–old? Yesterday it seemed like things are changing. Today it feels like same-old same-old. The Fed wants to raise rates a bit so that if we go into another recession(didn’t know we ever got out of the current mess), they have a tool to help with stimulus. At this point the fed rate is so low they would have to pay you to take money if they went much lower. We need: Smaller government, less welfare, income tax reform, lower property taxes, close the borders, etc. And how exactly would less welfare, income tax reform and closed borders help unemployment and job growth? Or were you just regurgitating conservative ideologies as if they are the magical fix for the systemic problems and income inequality facing our great nation? Less welfare helps two ways: the welfare recipient goes from being a tax burden to a tax contributor. Income tax reform would flatten the tax rates and eliminate unfair loop holes, confusion and inefficiency that we all pay for. Close the borders and put the people here to work with the jobs available. Hold employers accountable for hiring illegals and raise the wages of people picking vegetables. I would be glad to pay more for a head of lettuce if I knew it was picked by a US citizen. Its not conservative ideology… it’s common sense logic. There has been income inequality since the beginning of time. The simple fact of the matter is that there are rewards for hard work, discipline and intelligence. Every successful person I know(and I know alot of them) works hard and makes more wise decisions than foolish. 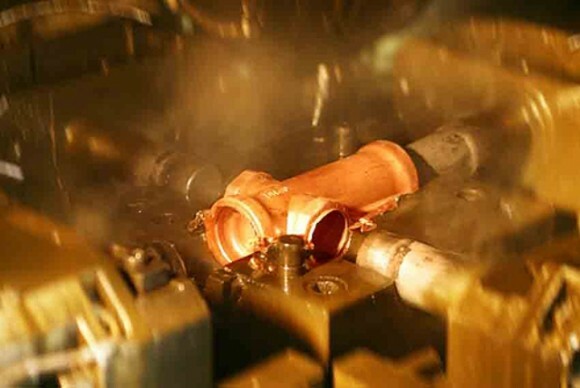 As a fitting manufacture we are looking into warm forming as a means into reducing our material costs and are vesting into Italian transfer machines and rebuilt multispindles. Much of our work is looking at ways to beat China manufacturing and oppertunity has been identified in lead time reduction while the prouduction costs can come close if we utilize cellular manufacturing. We are also looking into assembling at the machining cells though we need to work through many concerns but all of this would not be thought of 10 years ago. I suppose it depends on which economy we’re talking about, the one we live in that depends on our wages, and the success of products we manufacture vs the imaginary economic slot machine that is Wall Street. Look at what the stock market has done in the past 7 years of high unemployment and low wages, its unmistakably good for them as the wealth they are earning is being squeezed out of the real economy of workers and goods. High wages and jobs are being eliminated to eek out every ounce of profit for those at the top, and rising wages, job rates and interest rates threatens their flow of money.